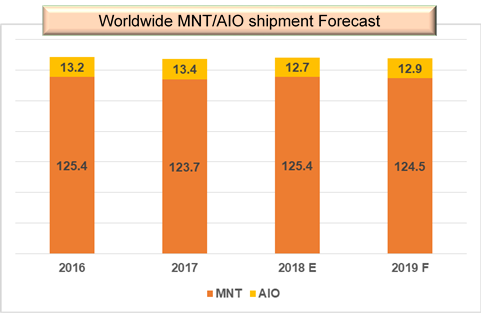 For LCD monitor/AIO shipment, it turned upwards growth ahead of time in 2018. Its shipment rose 07% YoY. The 4 main reasons that LCD monitor shipment increased in 2018 were below. Panel prices reached low to mid range. The demand in North America has been strong. Demand of gaming products has been well. Borderless products were sold well.